A year ago, I was in a place where I struggled between wanting to focus on weight loss and wanting to learn body positivity at my current size. Trying to do both was very difficult for me, and I ended up spending more time on the latter goal. I wrote a whole series of posts on the subject, and I bought some clothes that were more my-style and less going-for-invisibility. Early this year, though, I switched back into invisible, and more than that, I began a new struggle. I didn’t want to buy new clothes at this size. It felt like acquiescence and a waste all at once. If I bought clothes at this size, the logic went, then 1) I’d feel guilty if I lost weight because I’d spent the money on them, and 2) I’d be more comfortable in my clothes and would therefore be less motivated to lose weight. I’ve hardly bought anything this year, except some fall/winter clothing in the last few months since I didn’t have any that would suffice in Wisconsin. Even then, what I bought was bare minimums, a week’s worth of clothes that I could wear over and over. I picked them for functionality more than style, and honestly didn’t even care if they didn’t fully fit properly. What did it matter if they fit well? I’m not going to look okay no matter what right now, is what my brain told me. The weekend after Thanksgiving, when all the cyber Monday stuff was going on, I caught myself staring at long-sleeved dresses on Modcloth. I haven’t ordered from Modcloth in a year, mostly because of money constraints (mixed with the idea that I shouldn’t spend money on “temporary” clothes). They had a decent sale going on, and there were six items I wanted to buy, including three dresses. The other three items weren’t size-based, so I had no problems ordering them, but I spent a long time thinking about the dresses. Long story short, I eventually ordered them. I couldn’t say if I ordered them because it was retail therapy or because I wanted to say f-you to the negative voice in my head or because Jason said it would be good for me to buy them. Whatever the case, they’ve now arrived. I was surprised by just how much I loved them. I honestly expected to try them on and feel discouraged by my size, but instead, they make me feel good about myself and not worry about my size so much. I guess that’s the best way, right? It feels strange to think this way, to think hey, yes, my body is obese and I am large, but hell yeah I also look good. It’s a good feeling, and still very foreign to me. I don’t know how long I’ll fit into these dresses. Maybe for a long time, maybe not. In the meantime, though, I’m happy with whatever motivated my decision to buy, and perhaps in the future, I’ll be less concerned with the negatives above and will treat myself more often to things I love. PS – Dresses over jeans should be the style. I’ve thought so since college. Only I’m old enough now to do it without worrying about what anyone will think about my personal sense of fashion and style. Ha! 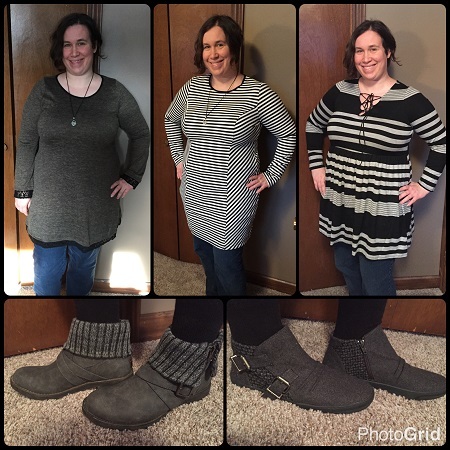 This entry was posted in Personal and tagged body image, Wellness Wednesday. Bookmark the permalink. I swear we have the same brain some days! Do you know how much time I have spent trying to reconcile body positivity with weight loss/being healthy? Hell, I still struggle with this. I know what you mean when you don’t want to buy clothes in a certain size because you think/hope it will be only a temporary size and that buying them will be incentive not to try. Good for you for buying those dresses. Life is too short to not feel beautiful or powerful or both when dressed, no matter what your size, and we should fight that nasty demon in our head telling us otherwise. Now to try to keep that more positive parts of our brain dominant!